Buy If You Care Large Unbleached Baking Cups - 60 cups in the UK from our online shop or directly from our independent Scottish store. 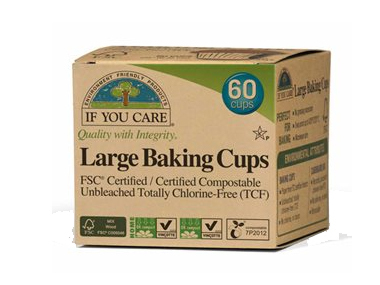 These unbleached, chlorine free, fsc certified and certified compostable large baking cups are ideal for the environment and for all your baking needs! Who doesn't want chocolate on cold, January days? What's even better is that these cupcakes are dairy free and gluten free and made with low GI ingredients! This recipe contains Chlorine free Baking Cups. We sell real If You Care and other Homeware directly from our shop in Scotland and online throughout the UK. View more products from If You Care. Where can you buy real Baking Cups - Large safely online? If you are wondering where you can buy If You Care Large Unbleached Baking Cups - 60 cups safely online in the UK, then shop with us. Baking Cups - Large - If You Care Large Unbleached Baking Cups - 60 cups in Homeware and Household.